I’ve been admiring the Bayside Romper by New Horizons Designs for quite a while, so when they announced the revamping of the pattern I jumped on the testing wagon! This pattern is just as amazing as I had imagined! 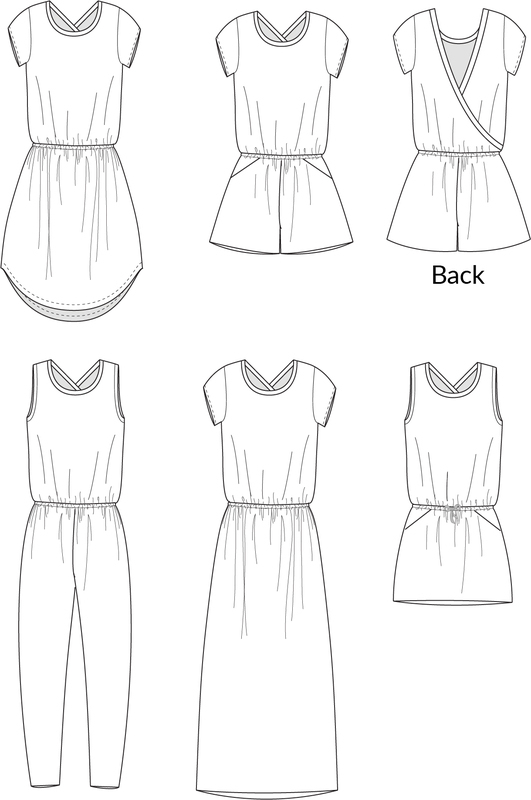 To start with, let’s talk options: it can be a romper or a dress! How great is that? The wow factor of the Bayside is definitely the back! Love that crossed over detail! The pattern calls for knit fabrics and preferably something with a nice drape to it. I used a Cotton Lycra and even though I’m in LOVE with my dress, for the next one I’ll use a more drapey, relaxed knit. When I make my Bayside pant romper I’ll probably use a stiffer fabric for the bottom part and a light knit for the top. I feel a bit insecure wearing lightweight knit pants… the lumps and bumps need some more stability, kwim? I’m obsessed with this color, btw! I usually get so obsessed with all the pretty prints, that I forget how awesome solids are! I got this yummy army green CL at my favorite local fabric shop: Stof-inc.com. This is a great way to look put together, feel great about yourself and be super comfortable at the same time! !